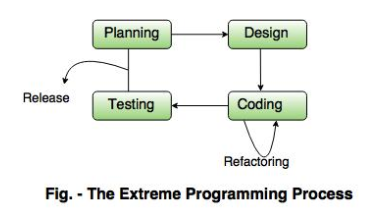 The Extreme Programming is commonly used agile process model. It uses the concept of object-oriented programming. A developer focuses on the framework activities like planning, design, coding and testing. XP has a set of rules and practices. Building software development process needs communication between the developer and the customer. The simple design is easy to implement in code. Feedback guides the development process in the right direction. In every development process there will always be a pressure situation. The courage or the discipline to deal with it surely makes the task easy. Agile process should inculcate the habit to respect all team members, other stake holders and customer. Planning starts with the requirements gathering which enables XP team to understand the rules for the software. The XP design follows the 'keep it simple' principle. A simple design always prefers the more difficult representation. The coding is started after the initial design work is over. After the initial design work is done, the team creates a set of unit tests which can test each situation that should be a part of the release. The developer is focused on what must be implemented to pass the test. Two people are assigned to create the code. It is an important concept in coding activity. Validation testing of the system occurs on a daily basis. It gives the XP team a regular indication of the progress.